Our unique program is offered in different parts of the country so you can take advantage of your stay in the most beautiful settings that Costa Rica has to offer. We offer homestays as well as different kinds of lodgings to customize your trip. 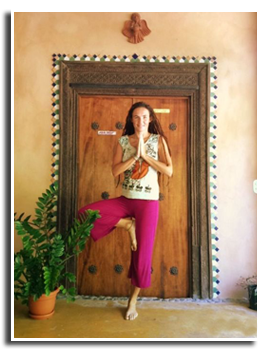 You can have classes at our location or we can send the teacher to you, wherever you are at no extra cost in Puerto Viejo. Spanish instruction is available starting with one week to one year or more with weekly sessions of four hours of class-time daily (Monday through Friday). We keep group sizes small to ensure individualized attention for every student. Groups usually consist of two or three students. The maximum group size is six students.Our beach campus is located in the enchanting area of Puerto Viejo, Limon which is on the tropical, verdant Atlantic coast. This beautiful beach town is a wonderful blend of Costa Rican, Afro-caribean, indigenous and international peoples and cultures. 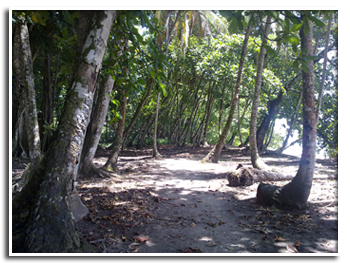 However, the highlight of Puerto Viejo is the amazing natural wonders that await you. There are miles of pristine beaches and coral reefs to explore along with the exotic flora and fauna you will find in the Gondoca-Manzanillo wildlife refuge. Classes and accommodations are held in a hotel facility which is just a short bike ride or walk into the seaside village of Puerto Viejo at the homestay which is right in town. If you prefer to choose your own accommodation or hotel we can send the teacher to you. For arrangements please contact us. We will be glad to help you also with reservations and recommendations for hotels or rentals if you do not wish to stay at a homestay. The town itself has lots of great restaurants with cuisines from all over the world, an outdoor movie theater, wonderful art shops, tempting cafes, bakeries and ice-cream parlors, internet cafes, clothing and food stores and an amazing night life. There is always live music in one of the local eateries and pubs and you can always dance at Johnny's Place, with its nightly bonfire, candle lit tables on the beach right next to the coral reef under the summer moon. Y ou can't ask for a better ambiance. Tours can be taken to go swimming with the dolphins, scuba-diving, snorkeling in the crystal clear coral reefs and sea. You can choose to go river-kayaking in the mangroves and watch many different kinds of birds and wild life. Puerto Viejo has world reknown surfing and lessons are available. The enormous leather-back turtle nests in the Gandoca-Manzillo reserve where you can also see exotic bird life, Howler monkeys and it is said that there are even manatees in the lagoon. There are relaxing yoga classes and massages available with one of the best teachers in town and if you want more strenuous activity then you can try a pilates class. Yoga classes can be pre-arranged as part of your program. A rare glimpse into the lives and culture of the indigenous people of the Talamanca mountains can be had by visits to the their nearby villages. Rent a bike, a motorbike or an ATV and check out the 14 kilometer stretch of beaches between Puerto Viejo and take lazily walks on the gorgeous sands of the Gandoca-Manzanillo reserve. Tours to a chocolate farm, botanical gardens and zip lines are all just minutes away. Zipline through the canopy among monkeys and toucans. Many volunteering opportunities are available in Puerto Viejo. You can help the kids in an art center or school, protect the leatherback turtles, work with the women entrepreneurs in the area and aid the indigenous peoples that live in the surroundings.There are many other volunteer opportunities in the area. Information upon request. Homestays are available so you can enhance your experience by living with a family from the Caribbean area. Please note that homestays in this region are simple and have no air conditioning however it is an enriching cultural. experience like no other. 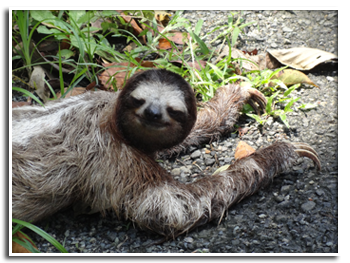 Homestays include 3 meals a day in Puerto Viejo. Classes are held from Monday to Friday from 9 am to 1 pm following the same communicative methodology and philosophy as the Heredia campus. (See METHODOLOGY). IPED offers several options to get to the beach campus. For any of these options please contact us so we can make arrangements for you. 1) We recommend that come to the Heredia campus first so we, David and Zaida, get to know you and help orient you for the rest of your trip. 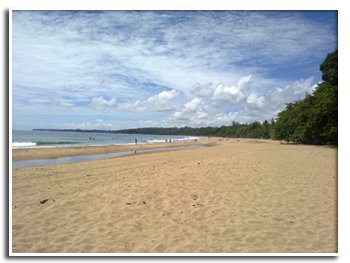 There are direct buses that go to Puerto Viejo at a relatively low cost. 2) Taxi options from Santa Maria Airport are available as well as car rentals. If you decide to rent a car we can make arrangements for you. Starting dates for this program at the beach will be held every Monday. ¨Please see Prices and Registration page.